Yup, it's Girl Scout cookie season! Girl Scout cookies are everywhere and I can't help but buy a box (or 2 or 3) every time I pass by the girls selling outside the grocery store... because I too, was once a Girl Scout, giddy and excited to sell the most boxes for my troop (this was back where it was safe to go door to door). So with all this hard work selling cookies, what about some cookies for the girls? So I took some vanilla wafer cookies and created little Girl Scouts on a stick, aka "Girl Scout Cookie Pops"! Note: To add a marshmallow center to your pops, check out how technique in my pilgrim cookie pops post here! Spread some melted chocolate on flat side of one Nilla Wafer and press on lollipop stick. Top with second Nilla Wafer, flat side down, gently pressing to "glue" the two cookies together. Microwave tootsie roll/fruit chew candy for a few seconds until pliable and mold into desired hair do. I used a tootsie roll for the brunette and Starburst for the blonde and red head. Attach hair and eyes to Nilla Wafer with melted chocolate. Take the green candy melt and "glue" to the top of the head with melted chocolate. Draw on the eyes and mouth with the edible markers. Tie a green ribbon around the stick just below the cookie. 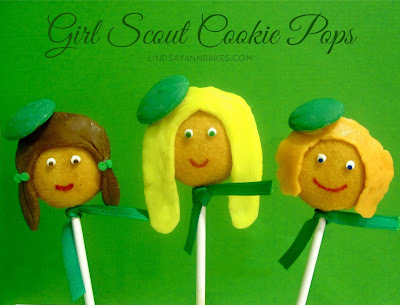 Package them up individually in clear plastic bags with a green ribbon for a sweet gift for each of the girls, or even create an edible art project out of it for the troop to sit around a table and create their own Girl Scout Cookie Pops to take home! You can even create a display that your pops can stand upright in, take a block of Styrofoam and wrap it in festive wrapping paper or tissue paper. Push the bottom of each stick into the styrofoam for guests to easily grab and enjoy. I couldn't find a picture of me selling Girl Scout cookies, but here is little me as a "Brownie" on my way to becoming a Girl Scout.